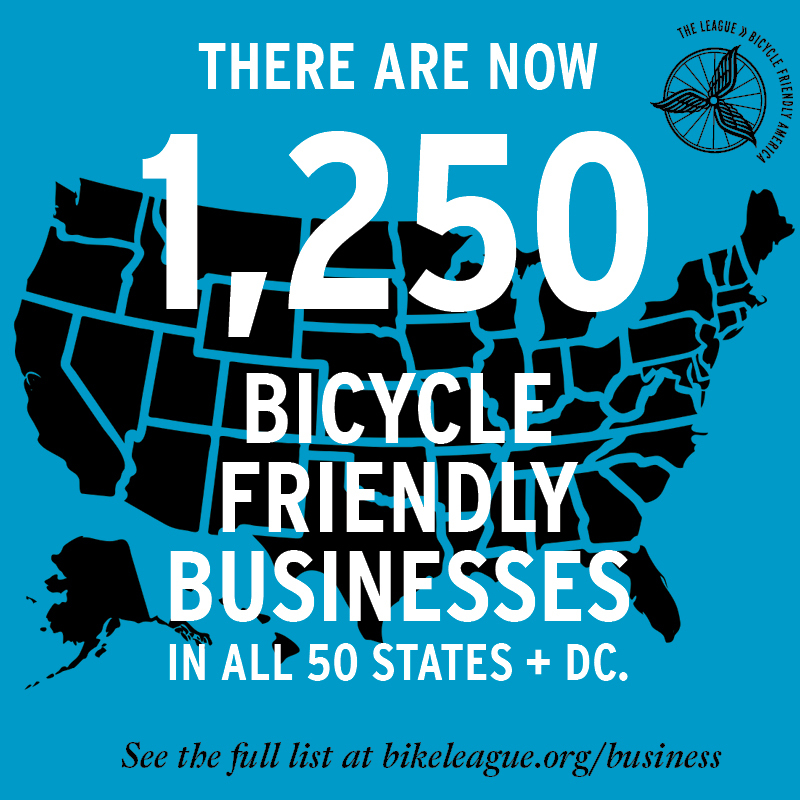 Today, the League of American Bicyclists — the nonprofit leader in the movement to create a more bicycle-friendly America — has awarded prestigious Bicycle Friendly Business Bronze, Silver, Gold or Platinum certifications to 64 companies in 25 states and the District of Columbia. Six of these companies earned the highest-level Platinum BFB certification: LinkedIn, the California-based technology firm; World of Bikes, a bike shop in Iowa City, IA; first-time applicant Heartland Bike Share, an Omaha, NE, nonprofit bikeshare provider; Landry’s Bicycles, a bike shop in Natick, MA; and two Asheville, NC-based companies, Liberty Bicycles and first-time applicant New Belgium Brewing Company-Asheville. 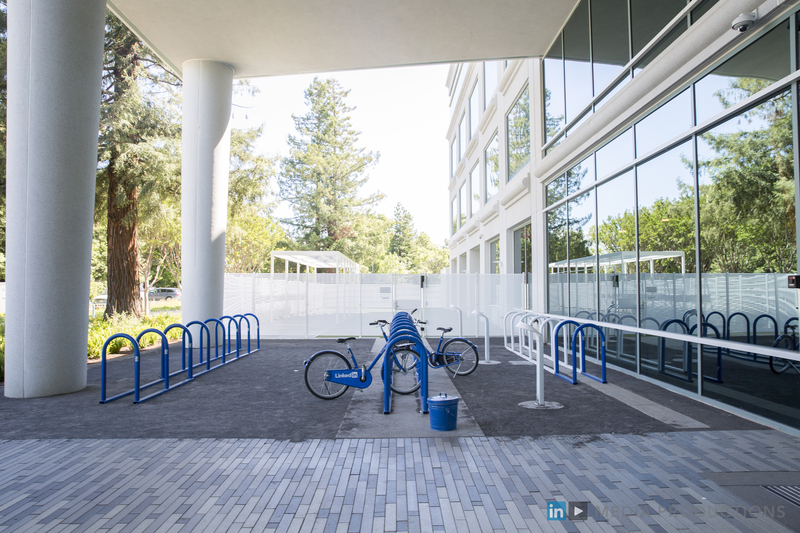 Outdoor bike parking at Platinum-level Bicycle Friendly Business LinkedIn in Sunnyvale, CA. Applicants to the competitive BFB program are evaluated based on nearly 100 data points related to bicycle-friendly facilities and accessibility, culture-building events, safety education programming and other practices, policies, and incentives that encourage bicycling. All 1,250 current BFBs are easily found via the League’s interactive awards map. 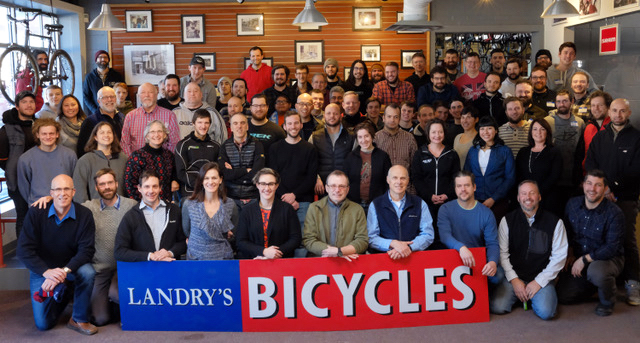 Employees at Platinum BFB Landry’s Bicycles company meeting, January 2018, hosted at Landry's Natick headquarters location. Among the program trends Neptune has identified is a clear uptick in the number of successful first-time applicants, whose efforts have been robust enough that they qualify for certification with their initial submission. Among this latest class of BFBs, 46 companies received one of the four levels of recognition, up from 13 in founding year 2008. The League also is recognizing three additional businesses with Honorable Mention status. All BFB applicants, whether they earn an award designation or not, receive detailed feedback reports of ways to continue improving their bicycling promotion efforts. Another trend is the growing percentage of BFBs that support bicycling beyond their own workplace by funding bicycle advocacy across their communities, states and country. Sixty-one percent of this round’s BFBs reported providing financial support to local, state, and/or national advocacy efforts happening outside the business. 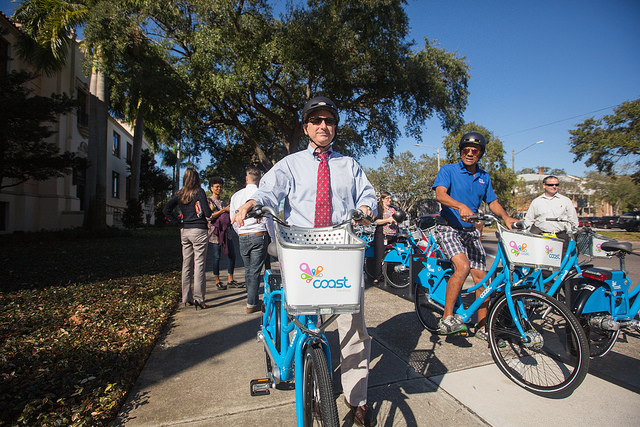 St. Petersburg, FL, Mayor, Rick Kriseman, riding a Coast Bike Share bike. The City of St. Petersburg's City Hall is a new Silver-level BFB, and Coast Bike Share is a new Gold-level BFB. Relatedly, the League has seen an increase in local efforts to use the BFB program as an effective way to engage businesses in bike advocacy and generate more support for bicycling improvements in the community. St. Petersburg, FL, for example, has 11 new BFBs thanks to a local effort promoting BFB status, bringing the city’s total to 32, up from zero just two years ago. The public is invited to follow the League’s Blog at www.bikeleague.org/blog for compelling stories, statistics and progress by BFB recipients, as well as advances made by honorees among the League’s Bicycle Friendly States, Bicycle Friendly Universities and Bicycle Friendly Communities. To learn more about the BFB program or to apply, visit bikeleague.org/business. Funded through a partnership of the League of American Bicyclists and Dero Bike Racks, the Bicycle Friendly Business program is one of four core elements of a larger campaign to create a Bicycle Friendly America for everyone. The League and its 17,000 members also support and encourage bicyclists’ rights and safety via their Bicycle Friendly Community, Bicycle Friendly State and Bicycle Friendly University programs. Learn more at www.bikeleague.org/BFA. Founded in 1880, the League of American Bicyclists is leading a national grassroots movement to get more people riding bikes and to maximize their safely and convenience so they can “enjoy the ride.” The League advances its mission through actively listening and learning, recommending standards, sharing best practices and engaging diverse stakeholders as a powerful, unified voice for change.